There are over 50K WordPress plugins in the official WordPress Plugin Directory. The plugin repository directory is enriching every day with new plugins as per user needs. The plugins reduce lots of work on your part for building a WordPress website no matter if it’s a minimal website, blog, online shop or business website. So, there are plugins for almost every use case, function or feature you need as per your requirements. Also, you’ll find multiple plugins for the same function or use case, in this situation, you have to choose the best one for yourself that works best on your website. In this article, we have listed Top Freemium(Free & Premium) must needed plugins for any WordPress website in 2019. One of the most popular security plugin in the WordPress plugin repository. The plugin has over 700K+ active installations with 5-star ratings. This plugin reduces security risk by checking for any vulnerabilities, and by implementing and enforcing the latest recommended WordPress security practices and techniques. The plugin security and firewall features are set up as “Basic”, “Intermediate” or “Advanced”. Moreover, it’s 100% free plugin. All In One WP Security & Firewall is very easy to use and understand. Prevent Brute Force Login Attack and more! Alternative plugins: Above is the best in my opinion but you may try a different one that looks good to you like: Akismet, Wordfence Security, VaultPress, iThemes Security. Each of us wants a super speedy website. A fast loading website not only gives great user experience but also helps in better search ranking. There are many plugins which you can use to make your blog load faster and one of the most common types of a plugin is cache plugin. Caching creates an ultra-fast load time, essential for improving Search Engine Optimization and increasing conversions whereas WP Rocket is number one for Page Caching, Optimization, Lazyload and more features! WP Rocket is what that you need to reach 7th Heaven. Alternative plugins: Above one is the best in our opinion but you may try a different one that looks good to you like: WP Fastest Cache, Autoptimize, W3 Total Cache, WP Super Cache, WP-Optimize, Fast Velocity Minify. Regenerate Thumbnails allows you to regenerate the image size of your uploaded images as per theme requirements. The plugin creates specifics size for one or more images that have been uploaded to your Media Library. It also offers the ability to delete old, unused thumbnails in order to free up server space. The superb thing about this plugin is that you can regenerate thumbnails for all image uploads, individual image uploads, or specific bulk image uploads. You can run Regenerate Thumbnails anytime from your admin dashboard Tools > Regenerate Thumbnails. Create perfect image size and helps to load the website more faster. Alternative plugins: Above one is the best in our opinion but you may try a different one that looks good to you like: Smush Image Compression and Optimization, ShortPixel Image Optimizer, EWWW Image Optimizer, Imsanity. Whenever we build a website no matter what is the niche or purpose of the website but a contact form is must be needed. The contact form used to connect us with the customer, visitor or well-wisher. WPForm is the BEST contact form plugin that comes with some cool and powerful pre-made templates, payment integrations and multi-step functionalities. The plugin allows you to create beautiful contact forms, subscription forms, payment forms, and other types of forms for your site in minutes, not hours! Check our previous article Top Freemium Contact Form Plugins For WordPress  to find out more contact form plugins with detailed features. Pre-made template, Instant Form Notification and so on. SEO or Search Engine Optimisation is the process of affecting the visibility of a website in a search engine. It’s also known as unpaid results—often referred to as “natural,” “organic,” or “earned” results for specific keywords. Yoast SEO is the original WordPress SEO plugin that do the job for you. Yoast SEO does everything in its power to please both visitors and search engine spiders to rank your website. Yoast SEO is the most comprehensive WordPress SEO plugin with many built-in tools and features. .htaccess and robots.txt editor and more. Alternative plugins: All in One SEO Pack, The SEO Framework, SEOPress, SmartCrawl SEO. Elementor is a drag-and-drop page builder plugin for WordPress. Whenever we intend to design a new page – the page builder helps us much to design the page faster and beautiful. Elementor is a live page builder, with no limits of design. You can design a page without ZERO coding knowledge. The page builder that delivers high-end page designs and advanced capabilities, never before seen on WordPress. Out of the box, Elementor comes up with a handful of interesting elements. Design many more page templates, pages or content blocks. Most popular WordPress website backup & restore plugin in WordPress Plugin Repository with over 2 million active installations. You can backup your website files and database into the cloud and restore with a single click. Hacking, server crashes, dodgy updates or simple user error can ruin a WordPress website. That’s why you need to backup your website. Using UpdraftPlus, you can backup website files into the cloud directly to Dropbox, Google Drive, Amazon S3 (or compatible), UpdraftVault, Rackspace Cloud, FTP, DreamObjects, Openstack Swift, and email. Easy to migrate website, Multisite/multi-network compatible. Alternative plugins: All-in-One WP Migration, Duplicator, BackWPup, Backup Buddy. 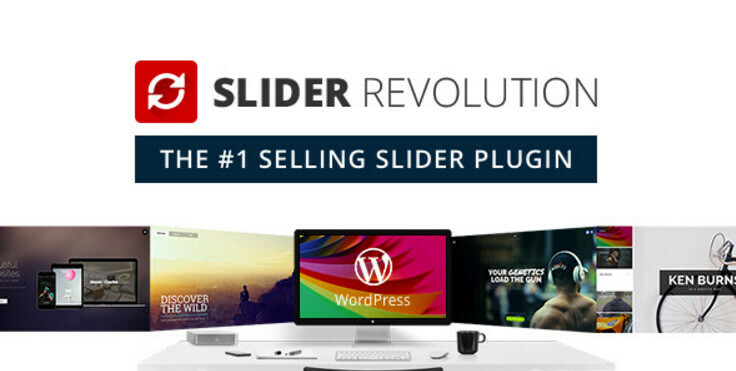 Slider Revolution is a popular and most used slider plugin to create a slider with images, videos, posts, social media, and other content. Slider Revolution is an innovative, responsive WordPress Slider Plugin that displays content the most beautiful way. Whether it’s a Slider, Carousel, Hero Image Scene or even a whole Front Page, the visual, drag & drop editor will let you tell your own stories in no time. The plugin is fully responsive and works on every device exist in the world! Works and Optimised on Desktops, Notebooks, Tablets & Smartphones. Alternative plugins: MetaSlider, Smart Slider 3, LayerSlider, Slider by Soliloquy. Popups by OptinMonster – Best WordPress Lead Generation Plugin. OptinMonster comes with an easy-to-use drag-and-drop popup builder that allows you to create beautiful email opt-in forms that are proven to convert. It allows you to create beautiful attention grabbing opt-in forms that convert well. OptinMonster gives you the power to convert your website visitors into subscribers and customers. Build your subscribers database wonderfully and fast with OptinMonster. OptinMonster allows you to build high-converting opt-in forms in minutes, not hours with pre-made form templates. Alternative plugins: MailChimp for WordPress, Bloom, Newsletter. With over 2 million active installs, MonsterInsights is the most popular Google Analytics plugin for WordPress. It’s easy to double your traffic and sales when you know exactly how people find and use your website and MonsterInsights shows you the stats that matter, so you can grow your business with confidence. Unlike other Google Analytics plugins, MonsterInsights allow you to enable all advanced Google analytics tracking features with just a few clicks from your admin dashboard! Audience Report like which device are they using, their age, gender, and a whole lot more. Simple, Clean, Lightweight and Easy to use social share plugin to share your website contents faster in different social media platform with a click. Easy Social Sharing plugin provides you with an easy way to display various popular social share buttons. Also comes with Social Share count feature too. The plugin contains 18 Popular social sharing buttons design that you can embed right into your posts, page. 7 Design Layouts, 4 Icons Layouts, Backend Live Preview. Alternative plugins: Super Socializer, Sassy Social Share, Social Pug! We have listed 11 best FREE & PREMIUM must needed plugin for any WordPress website or blog. We have selected the best and now it’s your turn to choose the right plugin as per your needs. Over several years, you may be using a common plugin for every need but it’s time to have a try if you are bored to taste something different. Good luck to you and thanks for your time to read the article. No matter if you like our list or not but you can always tell us which plugin you are using for your crucial need so we learn and share the experience with each other.